didn’t see a topic on this. sorry if there was one. you basically try to make as much money as possible, make deals with other players, screw people over with business deals, make secret deals. just make the most money to win. 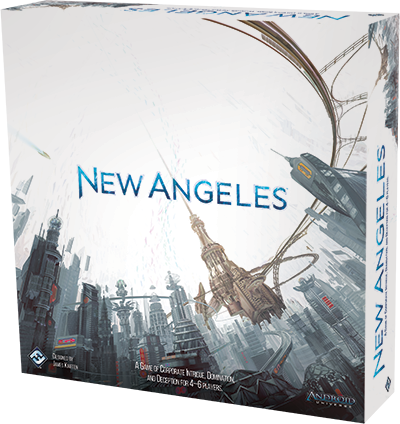 Accordingly, there are two goals in New Angeles. Your primary goal—and that of the game—is to increase your profits. Specifically, you need to earn more capital than your corporate rival in order to win. Your secondary concern, however, is to maintain order within the city. If it descends too far into chaos, the United States federal government will intervene, the city’s special commerce privileges will be put at risk, and you—along with the other corps—will lose. Mainframe didn’t look appealing to me (at least at first), and it really grew on me. now this one looks great right up front. i imagine it’ll just seem better and better the more info we find out about it. They say Globalsec & Melange Mining are players 5 and 6 (or 1 & 2, I don’t know). ah, my failed reading comprehension i guess. seems legit. It’s strange, in Mainframe, everyone is runners, there, everyone are corps. It makes me think of Dead of Winter, but less zombies and more wheeling and dealing. Managing your own resources will probably be easier and there’s no fear of all your survivors dying, but i think that board management may be more difficult with all the varying districts and the different type of issues that can come up. In the article they keep going on about “running the city” making sure the “little people are happy”. But they never said how to do any of that. The figures must mean something too. And, wait, Sunny works for a Megacorp. It really is the ‘War’ Ms Emylov is going on about! Looks like another FFG mechanic remix, probably heavily based on a previous design. Doesn’t seem overly interesting to me, to be honest. Yup yup yup, this is exactly what I want. Going to try to grab a demo of it while at GC, too bad it sounds like it won’t be there for a early release though. There’s a lot of cards, which can often be “exceptions” to the rules or format. Hopefully there are a lot of surprise plays and counterplays. FFG on point with taking my money this GenCon. This is also the first FFG game in the Android Universe that doesn’t have ‘Android’ in the title. Infiltration didn’t have “Android” in the title, actually. Interesting, but four players is a deal breaker for me. And since when is Melange Mining a megacorp? Been reading the Worlds of Android book. Melange Mining has a monopoly on HE-3, which is essential for the fusion energy the worlds depend on. None of the big 4 control it, because if one of them tries, the other three fight them off for fear of them gaining too much power. Melange doesn’t have the political influence of Weyland, the Network of NBN, the engineering of HB or the monopoly on life of Jinteki, but they are stupidly rich and powerful within their own sphere. Anyone doing business on the moon or beyond feel their power. Looks rather reminiscent of Pax Porfiriana with its competing shady businessmen trying to compete with each other while also preventing or capitalizing on economic collapse. Archipelago is also a little similar. e: yeah, losing the game if a revolt instigated by the players’ collective negligence breaks out with a secret objective that rewards you for letting the revolt happen is Archipelago as hell. Hopefully it’s good so you can get that tragedy of the commons action without the, uh, questionable depiction of the natives. Yeah, that’s where my train of thought went first. To be honest, the part about making deals sounds much less exciting than placing meeples on a board that expands as you explore, but I think I’ll wait until someone buys it and lets me play before I cement it in my mind as yet another Android game that I wish I cared about, but don’t. There are six corps in the game. Hmmm. I would totally be all-in for a new “deluxe” expansion that added GlobalSec and Melange as mini-Corp factions. Especially with how freaking rad the GS Chief is. We can’t have GlobalSec be a Corp faction. That could lead to the terrible scenario where Sunny and Jak hack their own Corp.